Comes with Tobacco pod included in the box. The Phix Vape Kit by Major League Vapers is a pod vaping 'pen style' system, which features a truly closed loop system and a powerful 320mAh battery. The kit has capacity for 1 x 1.5ml e-juice pod crafted specifically for the device and each pod offers around 400-450 puffs dependent on your usage. You can also expect around 200-220 puffs of the Phix after you have fully charged it, before it needs loading up again. The pods leak. I used the phix to quit smoking cigs and it worked. The problem is the pods leak so bad that I had to switch to another device. If they can solve for that I would go back. I prefer the previous version of the PHIX device and pods. The new style pods are impossible to refill enabling their reuse with your preferred e-juice/salts, to extend the pod life and option to lower nicotine content. PHIX should offer their pods in a variety of nicotine levels for those wanting to quite nicotine as well as smoking. This product is the BEST! WAY better than Zuul....the Phix gives a consistent draw start to finish...something I always have problems with in ZUUL. I highly recommend PHIX and especially the Electronic Tobacconist. ET is the best in service, prompt shipment and overall value. The starter kit was delivered as described and arrived prior to the delivery date. I would strongly recommend this site to all users. Bought grape ice menthol and hard strawberry. Grape stopped hitting after third pod, strawberry pods tasted burnt, all four of them. Menthol was just a wrong choice for me, those seem to hit just fine. used this for awhile, definitely great for someone just getting of the cigs. So ive bought two of the phixs and I absolutely love them but! The red wire keeps undoing and it wont charge or hit. I spend a lot of money on this product. Please fix this! I love this little bape so much I have two of them! Bought this to replace the XFire cause the capacity of eliquid is more. Sometimes bigger isn’t better. Yes, the pods hold more, but the flavors aren’t good and the pods leak horribly. Also very much dislike the charger. Very nice well made battery and pod very easy to use. I like that the battery is not a cylinder, when you set the unit down it can't roll off the counter. The mouth piece is very comfortable. The battery last several hours and takes about 35 to 40 min. to recharge. I did buy a second starter kit so I have 2 batteries. A year and a half ago, I stopped smoking Parliament Lights 100s. I chose the phix, because it does not feel like I am pulling mostly air, like the others. I also did not feel like I had to pull very hard to get the right pull, that mimics a cigarette. Very light weight, easy to hold in your pocket and has a magnetic holder to the pods and charger. The pods don't move in the device and the device doesn't move in the charger. Its easy to tell when its fully charged. Definitely great for a beginner. I love this thing so much that unfortunately I lost the first one I had to order another one! Saved money buying it online! And the flavors are great! Even the original tobacco which is my favorite and I definitely shared this with a couple friends and their buying their own too. It does help me not want to smoke a cigarette more than those other vapes with clouds of smoke that come out. It is a sleek, portable product. It charges relatively fast around 30-40 minutes for a full charge. If it stops hitting well, then you wipe the bottom of the cartridge with a paper towel. It's an amazing deal for its simplistic use and cheap cartridge prices. This Pod vaping unite is amazing. 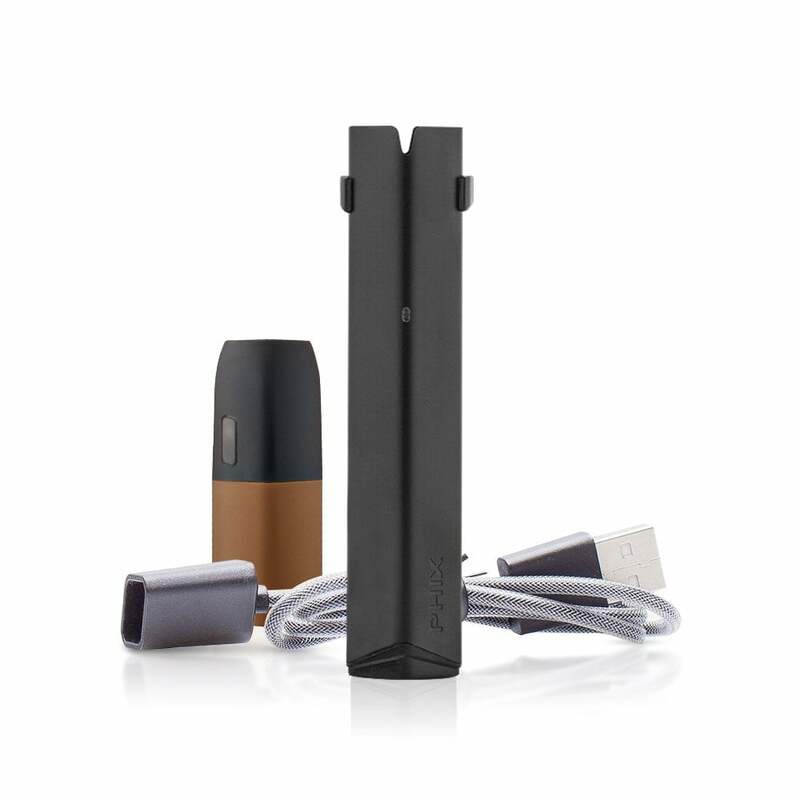 Not only is it discreet, it has a powerful enough battery to last you for hours. You can even go up to 2 days of usage for a light user. The price is just right. You do get what you pay for. The flavors that are available are delicious. Whether you like mint like flavors or fruity stuff. I'm sure you'll find the Phix to be one of the best Pod unites in the market. Also the shipping is fast. Was recommended this by the lady at my local vape store. Looking to quit smoking and wanted something that would fit in my pocket. She sold me the starter kit and I was blown away. So much so, I went back and got a second one. One to use while the other was charging. The Phix vape didn’t pull like a larger set, but it was close. Nice full vape experience. Then the starter kit sample pack of pods ran out. Bought 6 pod kits, 4 pods in each kit. That’s when the lip/mouthful of vape juice started. Roughly every other pod would do it. That stuff is horrible, and it would happen out of the blue. I’d put a new pod in, vape juice, throw that one away, new pod fine for a while, then vape juice galore out of the blue. Asked the lady at the vape store, she told me to keep it out of my car, keep it away from heat, even body heat from your pocket can cause it to give you a mouthful, always pull when it’s pointing down, and put it in the refrigerator if it’s giving you a mouthful. Really? Bought it to keep in my pocket. Not gonna make sure I’m pointing it down every time. And my mini portable fridge is on the blink, so I can’t refrigerate it every time it acts up. Too much typing here, but in short, tossed all that stuff and went with the juul. No, not as good vape experience or pull. But not once as given me a mouthful of juice. I will say when the Phix is working, it’s 10 times better than the juul. But the mouthful of vape once every 3 or 4 pulls (on average) isn’t worth it. Get a larger vape set, and if you have to go pocket size and nondescript, then go with the juul. Gave this 2 stars only because when it does work it’s awesome. Just don’t have the time to guess when it’s going to work well or when I’m going to down some juice.